Last year, Night Shade Books unleashed The Book of Cthulhu onto an unsuspecting world. Critically acclaimed as “the ultimate Cthulhu anthology” and “a ‘must read’ for fans of Lovecraft’s Cthulhu mythos,” The Book of Cthulhu went where no collection of mythos tales had gone before: to the very edge of madness… and beyond. For nearly a century, H. P. Lovecraft’s tales of malevolent Great Old Ones existing beyond the dimensions of this world, beyond the borders of sanity, have captured and held the imaginations of writers and aficionados of the dark, the macabre, the fantastic, and the horrible. 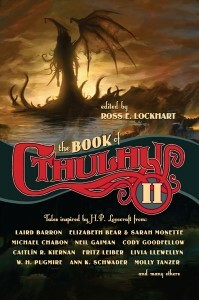 Now, because you demanded more, anthologist Ross E. Lockhart has risked all to dive back into the Cthulhu canon, combing through mind-shattering manuscripts and moldering tomes to bring you The Book of Cthulhu II, with even more tales of tentacles, terror, and madness. Featuring monstrous stories by many of weird fiction’s brightest lights, The Book of Cthulhu II brings you twenty-four more tales inspired by H. P. Lovecraft’s greatest creation: The Cthulhu Mythos.